Smartphones accounted for 39 per cent of mobile phone sales last year, a 12 percentage point gain over their share in 2011, according to Gartner. The one-year jump was the largest in history. In fact, in the four years from 2006 to 2010, smartphones only grew from 8 per cent to 19 per cent of total phone sales. Despite the big jump, smartphone penetration remains relatively low, at about 20 per cent globally. Interestingly, sales of all phones (including smartphones) actually declined last year, falling 2 per cent to 1.7 billion total units. 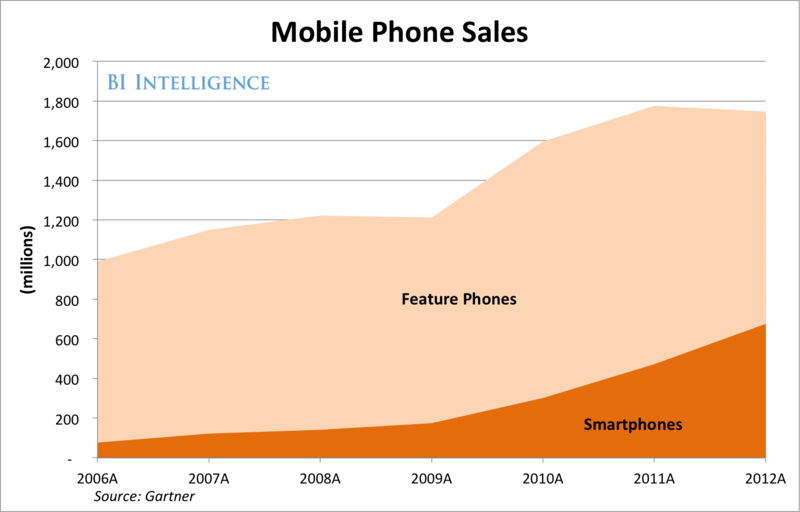 Subtracting smartphones sales of 675 million, we find that feature phone sales declined 18 per cent to 1.1 billion. This steep decline is a bit surprising. While smartphone sales will eventually overwhelm the feature phone market, there are still some 4 billion or so feature phone users worldwide and one would assume there is still a healthy market for new feature phones. Perhaps, however, there’s little need to upgrade feature phones, and in any case there may also be robust secondary markets for feature phones in the developing world, minimising the need for new purchases.